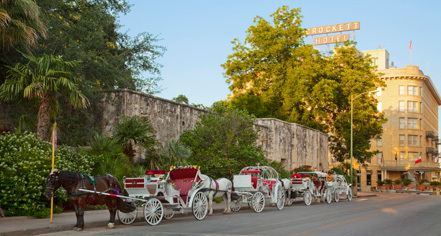 The Alamo: Located just ten steps from the Crockett Hotel. For twelve days in 1836, a small band of Texans were besieged by Santa Anna’s army. On the thirteenth day, all was lost. But an undying battle cry was born – Remember the Alamo. Arneson River Theatre: The River is as much a part of the performance as the performers here. The theatre features shows from mariachis to flamenco to opera to country and western music. Brakenridge Park, Zoo, and Japanese Tea Garden: Explore a world class zoo, or ride through the park on a miniature train. Discover the essence of serenity of the wonderful Japanese Tea Garden. Six Flags/Fiesta Texas: Outstanding theme park, with unforgettable thrill rides, numerous live music/dance shows and a large water park. IMAX Theater in Rivercenter Mall: Imagine seeing movies on a screen that’s six stories high! Hemisfair Park: The site of the 1968 World’s Fair, part of Hemisfair Park is now a water garden where you can spend a quiet interlude. Institute of Texan Cultures: Meet the many ethnic groups that built the Lone Star State in a museum where a lot of history can be touched first hand. Home to the annual Texas Folklife Festival in August. King William Historic District: An entire neighborhood of Victorian mansions built by San Antonio’s early German merchants, it’s an architectural treasure. 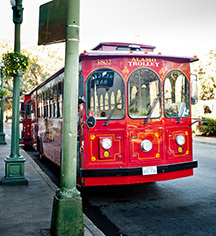 La Villita: San Antonio’s original settlement, its cobblestone paths will lead you to galleries, restaurants, and boutiques, all in charming buildings belonging to other centuries. Main Plaza: Central city square with city government buildings and San Fernando Catherdral. Market Square: Explore this exuberant Mexican market. It’s filled with colorful crafts, culture, food, and fun that give San Antonio so much of its flavor and charm. Mission Trail: Part of the National Park System, this is America’s most complete Spanish Colonial mission complex. The four sister missions of the Alamo each have a fascinating story to tell. Paseo Del Rio (The River Walk): Drink in the sights of River Walk, with its storybook collections of shops, galleries, and sidewalk cafes. It’s a great way to soak up the romance and charm of this very refreshing city. Seaworld San Antonio: The largest marine life theme park in the world. See Shamu, the killer whale, along with penguins, walruses, sea lions, and other sea life. Fabulous new water park Aquatica opened in 2012. Spanish Governor’s Palace: The date is 1749 on the massive door. Step through it and you are in Spanish Colonial Texas, where period furnishings will show you how life was both harsh and romantic.